Chicago reinvents and rebuilds itself every day Shipley Law Group works the builders' legal details from the ground up From the Loop to Kankakee, from Will to Winnebago, builders and business people create and re-create the physical vitality of the region known to the rest of America as Chicagoland. Our business and construction lawyers in Chicago, Shipley Law Group, reveres our community's mercantile history and celebrates its future every day with sharp legal counsel for those who make things happen in our region. Our Loop office at 135 South LaSalle Street is dedicated to the legal service of Chicago's builders and business people, the lifeblood of our city and state. We invite you to visit our web pages and our office. Here you will find legal excellence for those developers, contractors, owners, and businesses that cherish and recognize the entrepreneurial character of our commercial home. Construction litigation Construction law Insurance disputes General business litigation Business law We defend, prosecute and review matters for businesses and individuals. 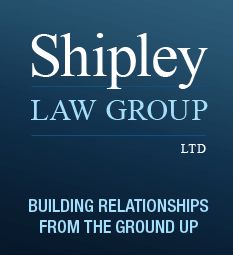 When you or your business is confronted with issues involving construction, contracts, insurance coverage or disputes, property or tort claims, come to Shipley Law Group for experienced representation combined with personalized service dedicated to achieving the client's goals and a favorable outcome. Passion for problem-solving We focus on the details and develop strategies to handle known issues and anticipate future issues. Our Chicago business attorneys are dedicated to your best interests. With courtroom trial work in state and federal courts, alternative dispute resolution, and mediation, we deliver the high level of success and satisfaction that you deliver for your own clients and customers. Our know-how and experience help us to anticipate problems before they have a chance to be expensive liabilities to you. Bring us into your plans early on so we can counsel you on effective methods for avoiding litigation. As Chicago business lawyers, we learn about you and your business and provide advice to help avoid stumbling blocks and find solutions for problems which have already surfaced. Passion for problem solving is the foundation of Shipley Law Group. Relationships are everything in business In business, especially construction, it is all about relationships. And solid contracts, sound insurance strategies, and serious legal counsel make the best business relationships. Our Chicago construction and business attorneys keep you educated, informed, and aware of everything you need to run an efficient and prosperous business that stays ahead of trends and steers clearly away from commercial snags. We treasure each and every business relationship with our clients. We practice law that makes sense for business. Join us for success and continued success. Legal solutions for Chicago's future with Shipley Law Group Our clients trust us to make legal sense out of every business process from Chicago's Loop to emerging business capitals throughout the state of Illinois. Write, call, or visit us for legal consultation that steers you clear from legal confrontation. Contact an attorney from our law firm by submitting our online email form, or by calling 312-444-0933 , or toll free at 888-493-8574 , or travel to our Chicago Loop office 135 South LaSalle Street, Suite 2100, Chicago, Illinois 60603. For immediate attention, send an email to robert.shipley@shipleylawgroup.com. We conduct the investigation, trial and appeal of matters requiring court appearances, or appearances before other tribunals. Our experience also enables us to provide advice and counsel to avoid litigation. We represent clients in state and federal courts as well as in alternative dispute forums, involving controversies in the following areas: Construction litigation These professionals benefit from representation by Shipley Law Group Suppliers Subcontractors Contractors Engineers Owners Architects Developers Construction managers Manufacturers Design professionals Builders risk insurers Sureties Construction lenders Material suppliers These are some of the services we offer to our construction litigant clients Implementing dispute resolution procedures Counseling clients on the management and avoidance of construction claims and disputes Representing design professionals, contractors, and owners in litigation matters Representing clients in construction and engineering cases involving hotels, convention centers, hospitals, and large developments Litigating design and construction defects Litigating injury and property tort claims Representing clients in insurance and other coverage claims Litigating and arbitrating construction disputes involving mass torts Representing architects and engineers in malpractice actions Representing clients in federal and state construction litigation claims Representing clients in private construction claims Negotiating, drafting, and reviewing national and international contracts For more information, please read Construction Law Tell us about your specific needs when you contact us. Insurance disputes Your most important legal action is a matter of preparation. Our most extensive legal activities fall under the categories of preparation and defense. Our favorite investment of time for you is in preparationbecause preparation makes the best defense for our clients. Prepare Contractors Review contracts to position contractors in legal places of safety from expensive insurance claim litigation Defend contractors, developers, and owners Property claims Business disputes Breach of contract disputes Tort claims Injury claims We represent you from any project stage where you encounter legal problems. But we encourage you to contact us at the earliest stages of your contract work. We enjoy making everything easy and inexpensive for our clients. Tell us about your specific needs when you contact us. General business litigation Like so many other arenas of life, it is all about relationships. And as we do in all the other parts of our law practice, we encourage you to get in touch with us as early on during your enterprise's life cycle as you can. It is our business to protect your interests. We protect you from lawsuits, shield you from exposure to business and personal liability, and help you keep proper business procedures in place. We also review and advise on appropriate insurance coverage. Our business law firm in Chicago advises all forms of commercial organizations, sole proprietorships, partnerships, limited liability companies and corporations regarding: Business Organization Commercial Law Corporate and Partnership Counseling Real Estate Litigation Legal solutions for Chicago's future with Shipley Law Group Our clients trust us to make legal sense out of every business process from Chicago's Loop to emerging business capitals throughout the state of Illinois. Write, call, or visit us for legal consultation that steers you clear from legal confrontation. Former faculty member, American Institute for Paralegal Studies, Inc.